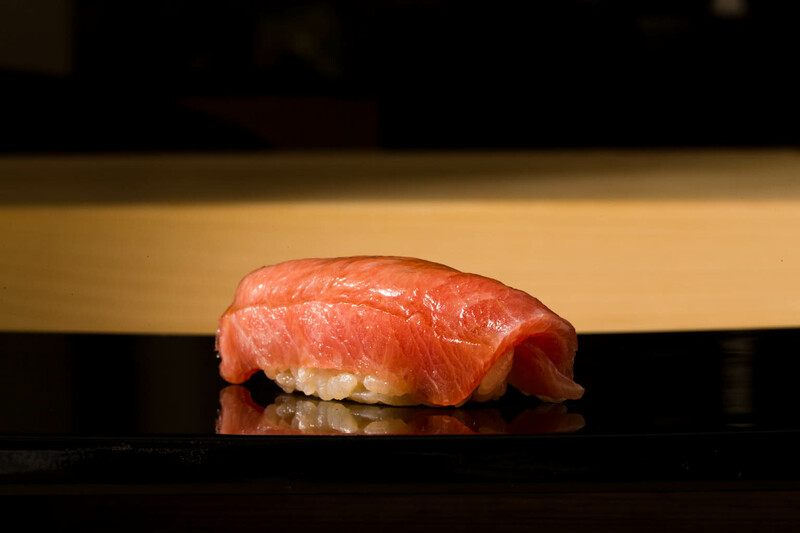 With just seven seats but three stars, it is no exaggeration to call Sushi Yoshitake exclusive. 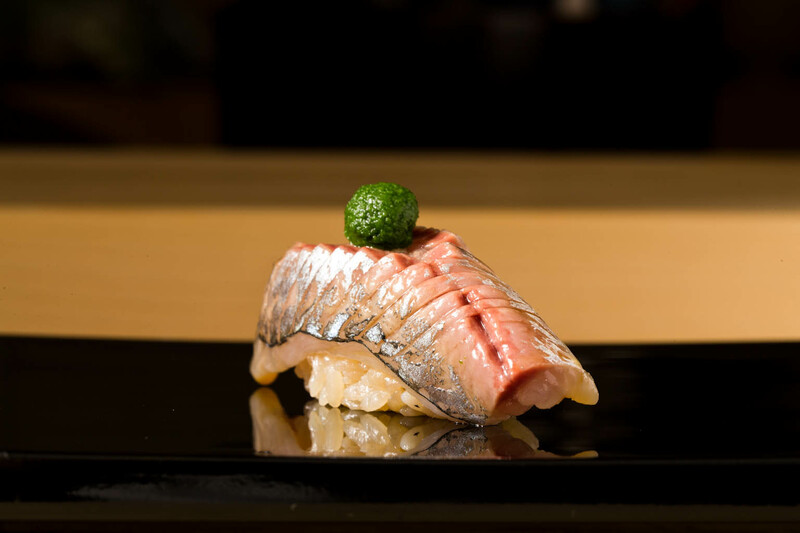 In the company of a master sushi chef who exudes kindness, and his welcoming team, savor each dish in the degustation course of mouth-watering sushi and flavorful tsumami small plates. 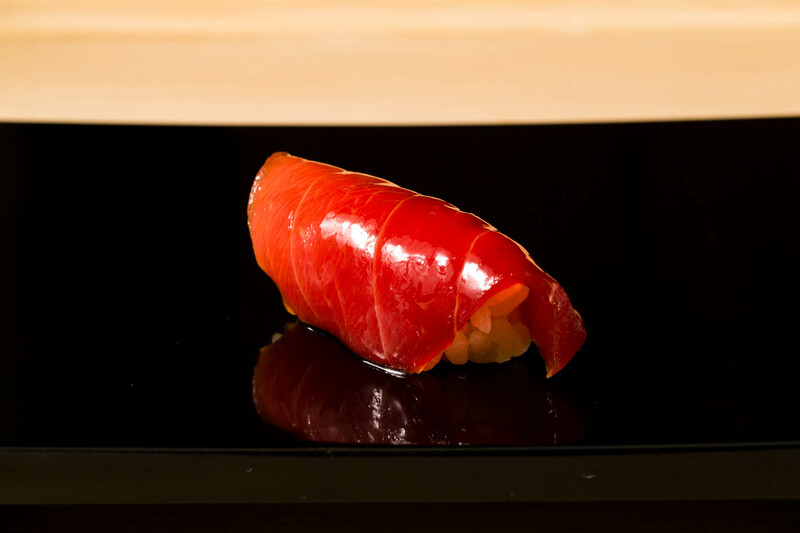 Challenges of the past have spurred Chef Yoshitake in the pursuit of perfect sushi and the ultimate in hospitality – this is your chance to devour it all. 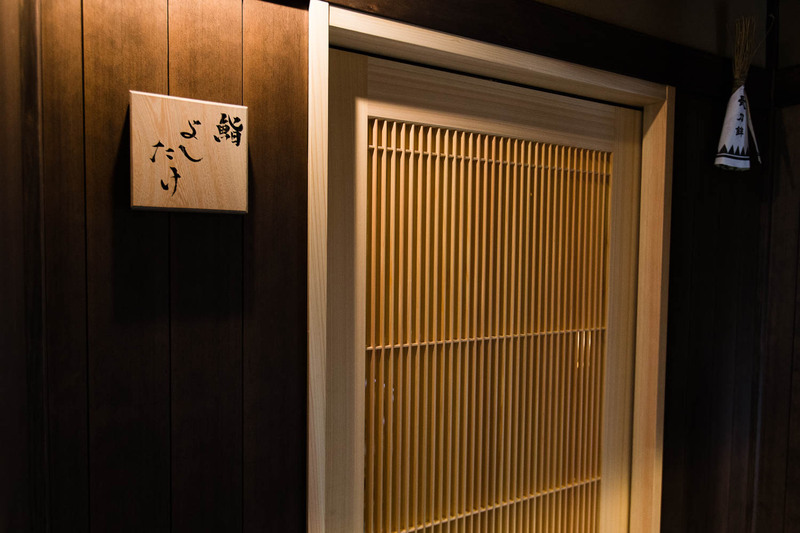 A short stroll from the boutiques along a narrow street in the eighth block area of Ginza, a wreath of dried chilli peppers and a small square sign lead you to a wooden sliding door, beyond which is an immaculate space. The friendly, comfortable atmosphere created by the loving husband and wife team immediately sets you at ease. 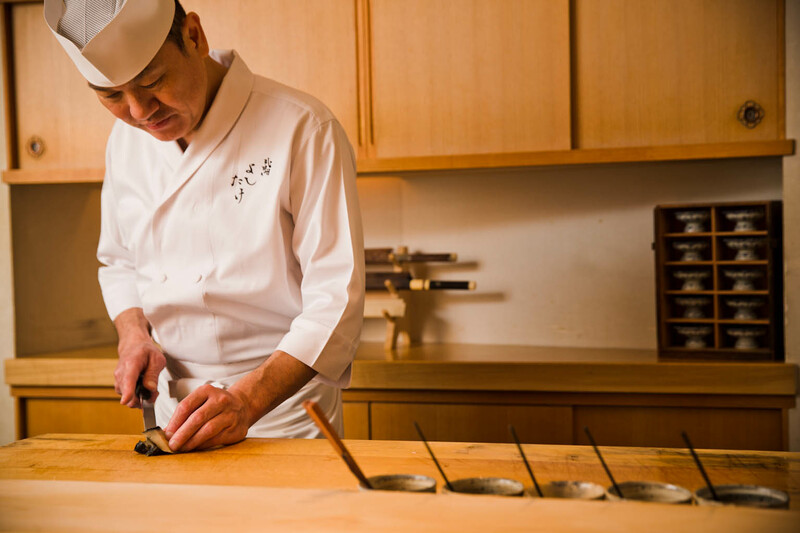 Chef Yoshitake presides over the pale wooden counter created from a single slab of timber. A slight bend and the counter envelops the kitchen making this an intimate setting for seven diners. Behind him on a stand are his prized knives. 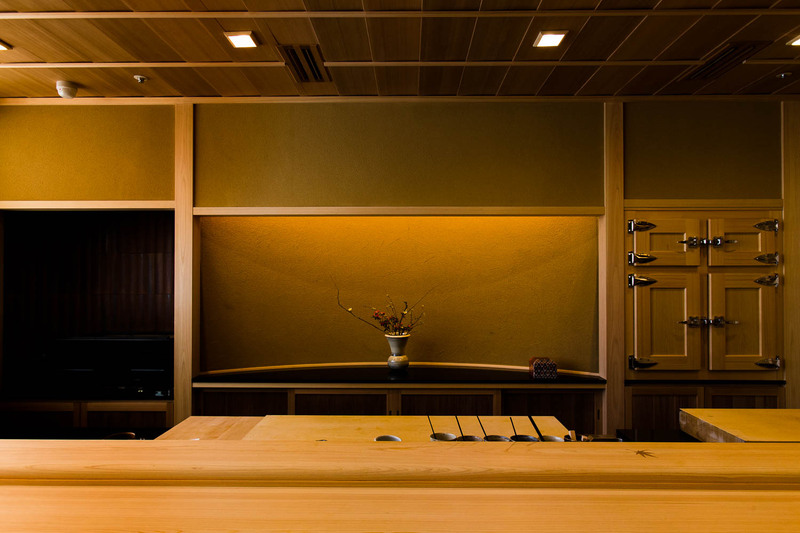 The minimalist interior and clean lines provide the backdrop for the beautiful colors, delicate knifework, and delicious aromas that will soon unfold right before you. The course at Yoshitake takes you through a series of nigiri sushi and tsumami, including all manner of goodness from the ocean. 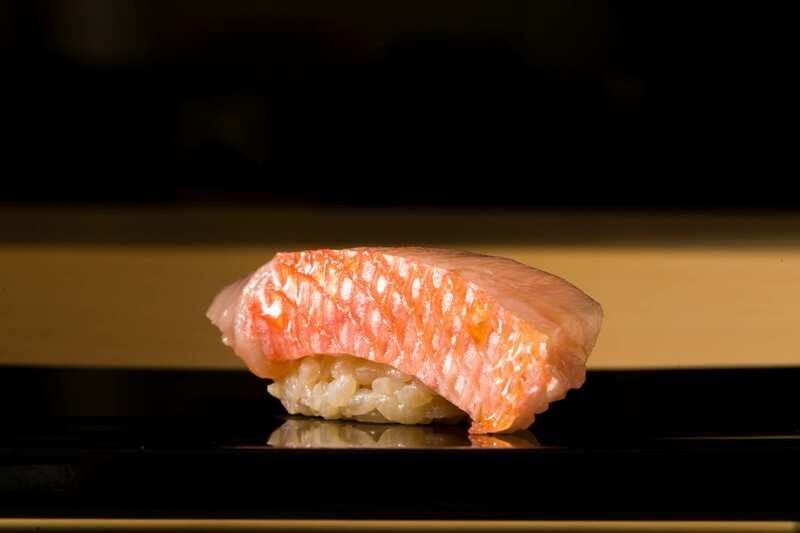 The chef delicately shapes the oval beds of rice for the carefully chosen and meticulously prepared slices of fish. He places it before his customers one delicious morsel at a time. Countless steps in the creation of superior sushi starts with the rice. The first washing and steaming of the rice are performed with hot spring water from Kagoshima. With very fine particles, the soft alkaline water is easily absorbed. 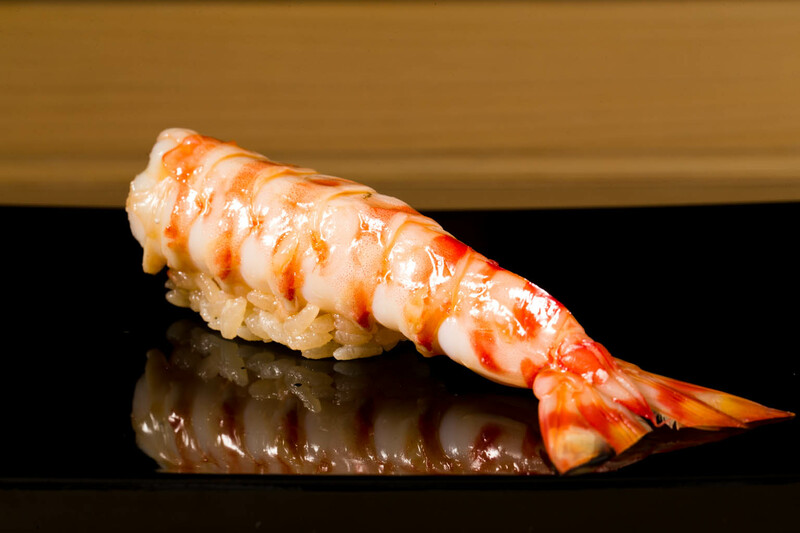 Minimal water allows the full flavor of the rice to emerge, after which red vinegar is added in the traditional Edomae style. For Yoshitake, the exquisite balance of flavors and the smile it brings to diners’ faces makes all the effort worthwhile. Yoshitake spends longer than most sushi chefs preparing the best seafood ingredients he has sourced each day. He goes to extraordinary measures to ensure the best flavors, harnessing his previous experiences as a chef of washoku and other cuisines. In fact, he spends more hours on preparation than the restaurant is actually open each day! 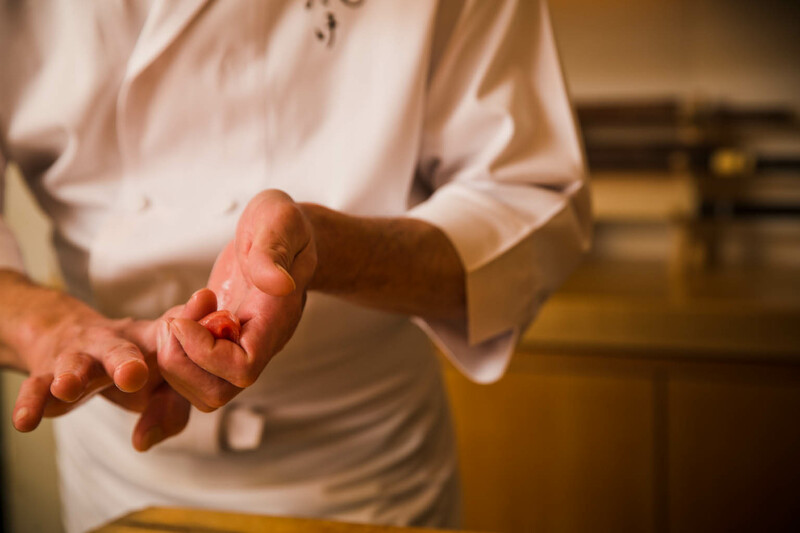 Throughout the course, you can enjoy a contrast of temperatures, textures and flavors – it is truly sublime. Yoshitake’s signature dish that never fails to lure customers back is a perfectly textured piece of abalone with a velvety abalone liver and uni sauce for dipping. Tender simmered octopus is full of flavor, and oysters are served with shiso and oyster juice jelly for delectable briny mouthfuls. 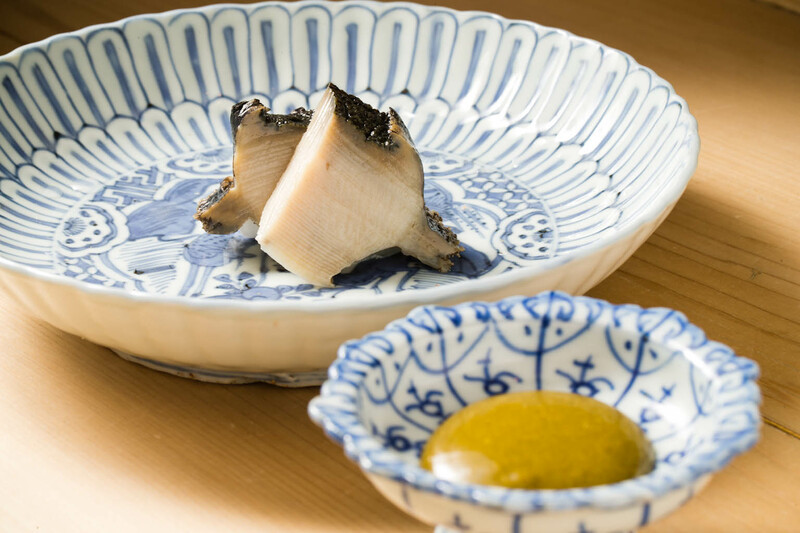 You might also be treated, depending on the season, to appetizing plates such as straw-smoked bonito, mackerel marinated in oyster oil, or deliciously plump sweet rice wine–simmered soft cod roe. 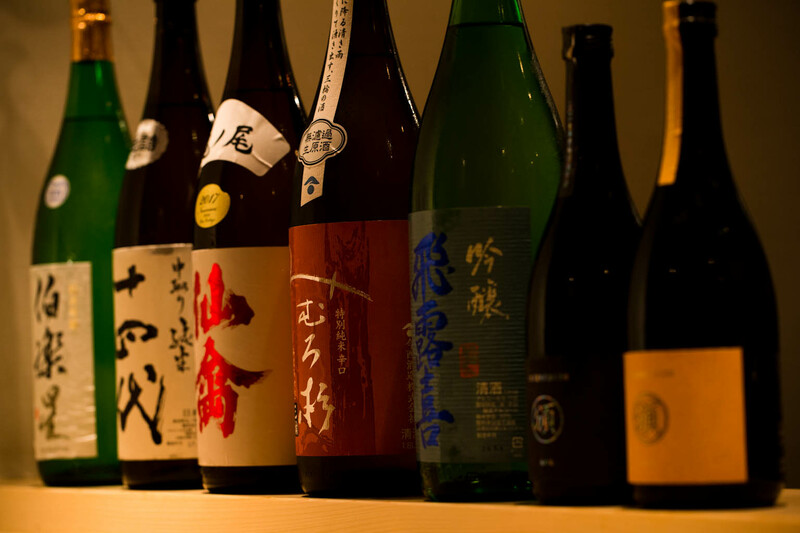 Enjoy your course with a drink from the extensive selection of sake, including several relatively rare varieties, or choose from an array of champagne, beer, whiskey or rice-based shochu, as well as premium wines by the bottle. Yoshitake uses his discerning eye and soft touch to select the best seafood coming into ports around Japan through his 7:30am daily visits to Tsukiji Market. Uni from Karatsu in Saga; octopus and sea bream from Akashi on the Seto Inland Sea; and other incredibly fresh, premium ingredients delivered directly to the restaurant from Yaizu in Shizuoka or Hagi in Yamaguchi. Charcoal is another element that plays a major part in Yoshitake’s cuisine: it heats the hagama traditional iron pots in which rice is steamed; proteins are grilled over it; and seaweed is roasted over an earthenware charcoal brazier just before serving. The aromas are irresistible. Yoshitake makes his own dashi and mixes the components to prepare his own soy sauce in house each day. 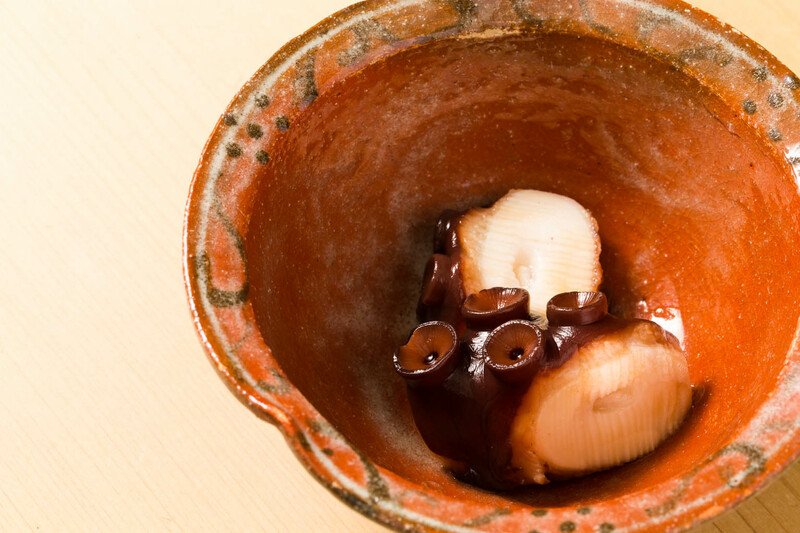 For deliciously tender octopus and abalone, the chef uses cast iron pots, with superb heat conduction, to gently simmer ingredients without losing any of the goodness of nutrients or flavor. Chef Masahiro Yoshitake is a sociable man; it is a pleasure to sit before him and chat as you partake in his cuisine. Awarded with three Michelin stars for both his Tokyo and Hong Kong restaurants in 2017, it would appear that Chef Yoshitake has always had the wind in his sails, but behind the glory there is enormous effort and years of trial and error. Born in landlocked Tochigi Prefecture, Yoshitake was blessed to have a mother who loved cooking. Helping her in the kitchen in his high school days inspired him to become a chef. While his dreams involved French cuisine, his father was adamant that sushi was the path to take in terms of building a career, going independent and staying in the business long-term. He reluctantly joined a sushi chain called Sushi Dento, but he now has nothing but gratitude for his father’s sage advice. In his sixth year with the company, in the midst of a booming economy, Yoshitake was sent to New York. He found his feet as a fully-fledged sushi chef and proudly served up delicious bites for the many Japanese and locals who called the city home. Returning to Japan three years later, he wanted to try new things and earn money for the future, so Yoshitake worked at a number of places, including a Central and South American eatery and a large-scale restaurant of Japanese cuisine. His open-mindedness has enabled him to adopt new ideas from these varied experiences throughout his career. 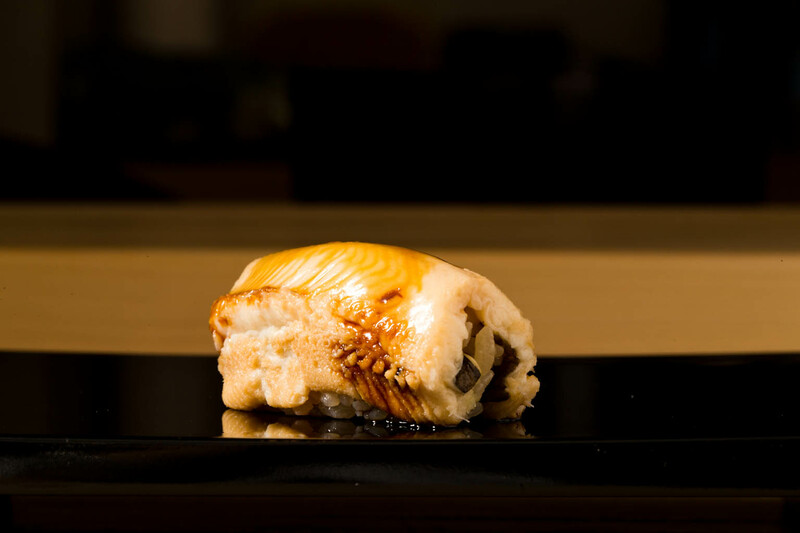 At 40 years old, Yoshitake went independent with a sushi restaurant in Roppongi, compromising on location because of the prohibitive rents of Ginza. But with few customers, business did not go well, prompting Yoshitake to find a space in Ginza and try again. It was not simply the change of location that made the difference; the hardship inspired Yoshitake, who during this time created techniques and dishes that are his signatures today. This is when he started using charcoal to heat his hagama rice-cooking pots. It is also when he realized that entertaining the customer by adding performance elements, like roasting seaweed over charcoals à la minute, are what really make for a complete dining experience. Indispensable at the time was the advice of the highly innovative Chef Yamamoto of Ryugin, who incidentally drew the characters that adorn Yoshitake’s signage. Confident in the style he has settled into, Chef Yoshitake plans to carry on with his eyes firmly on all elements of the business to ensure the quality he is now renowned for. At the same time, he wants to expand further overseas, someday returning to New York, this time with his very own sushi restaurant. 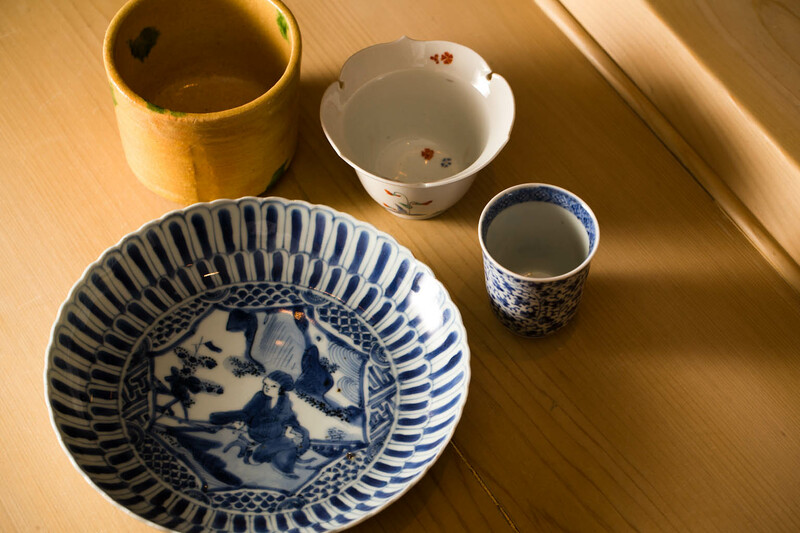 Yoshitake’s tableware collection includes antique pieces from China, and Arita Ware Kakiemon enameled ceramics made from porcelain with overglaze decoration. There is also Raku Ware – a favorite of tea ceremony masters for centuries. It is characterized by unique tones, a cracking effect, and glaze with a metallic appearance that all result from placing pieces into a preheated kiln, removing them while still hot, and smothering them in flammable materials like sawdust or leaves to inhibit the absorption of oxygen. Karatsu Ware, from Saga Prefecture on the southern island of Kyushu, is made from iron-rich clay and fired in climbing kilns. The earthy, natural-looking pieces can be simple and undecorated, or glazed. It is featured here, owing to Yoshitake’s special relationship with a Karatsu Ware artist called Taki Nakazato. Affectionately known as Taki-san, he is from a family of potters revered in Japan for more than 400 years. His father, the celebrated contemporary potter Takashi Nakazato, created the Nanban Style of Karatsu pottery, and his grandfather has been designated a living national treasure in Japan. 2 starting times: 6PM and 8:30PM.